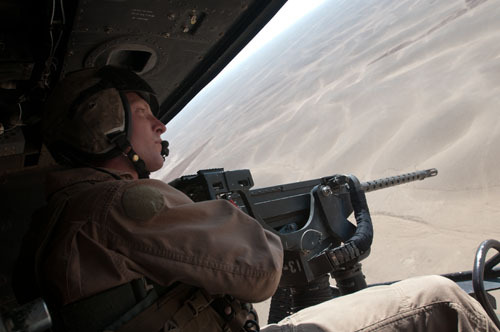 OVER HELMAND PROVINCE, Afghanistan – The Marine pilots peered closely at the ridgelines below, roaring through the sky in helicopters loaded with ordnance. The observation was part of a routine combat sustainment mission, which are conducted to keep the helos ready for war. They’re typically launched from the Marine flight line at Camp Bastion, a British base abutting Camp Leatherneck, the largest Marine installation in Afghanistan. A Sept. 14 attack on Bastion has brought a new sense of urgency to the job. As we’ve previously covered, 15 insurgents infiltrated the wire at Bastion that night, ultimately killing two Marines and wounding at least nine other coalition personnel. Six Harrier jump jets also were destroyed by rocket-propelled grenades, and two more were riddled with bullet holes, Marine officials said. Personnel with Marine Light Attack Squadron 469 were heavily involved with subduing those insurgents, said Lt. Col. Stephen Lightfoot, the unit’s commander. Huey and Cobra attack helicopters were launched, and many of the insurgents were engaged and killed from above. “We didn’t expect someone to break into the base,” Lightfoot said, standing on the flight line today in dark sunglasses and a flight suit. Capt. Adam Coker took us up afterward in the relatively new Yankee Huey. It was a routine mission of combat checks for Coker, the pilot, but it definitely got my blood pumping a few times. Coker pushed the bird to speeds of about 150 miles per hour, and had us roaring about 50 feet off the sandy desert floor at one point. Enlisted crew chiefs manning machine guns on the side opened fire on practice targets to make sure the weapons were in working order. The crew also observed potential POO sites, or points of origin, where indirect fire may be launched at Bastion. Nothing stuck and no one was engaged, but Coker and his fellow Marines are definitely watching. You all stay safe out there! Dan, I see that Sgt. Scott Moore credits you with helping him get his date with Mila Kunis. Please check out this hilarious video by Navy pilot Lt. Clayton Heyward which has become an international sensation. It’s at 25,000 views and gaining altitude. Please help him acquire his target!